… These are Worth the Effort … But I’ve Already Done the Work for You! 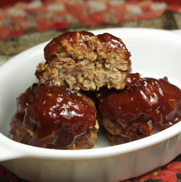 I’ve been playing with various ways to recreate my gluten-free, dairy-free barbecue meatballs without oats as the binder. I’m guessing this doesn’t seem like much of a challenge to some of you, but with a family member who’s gut is very precise about what is “acceptable” and what is not, it’s kept me busy for a while now. Until now. I’m so happy … really, SO HAPPY! You see, this recipe has been tested and taste-tested, and gut-tested multiple times with positive results. And now I’m ready to share it with you. 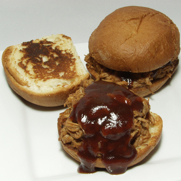 And now that I’ve done all the experimenting, the recipe is pretty straightforward for you. I love how they can be easily made ahead, either cooked or frozen as raw meatballs, then turned into a meal as needed. 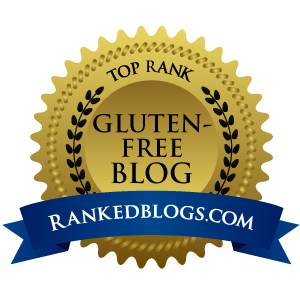 While the Glutino Table Crackers contain soy, which I try to avoid when possible, they create a crumb that binds the meat, eggs, and non-dairy milk to produce a most tender, moist, flavorful meatball that simply will not be rejected. 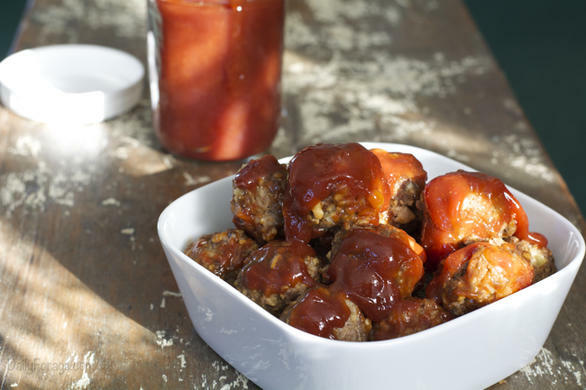 Dressed with a drizzling of sweet and tangy homemade barbecue sauce that bakes into a smooth glaze over the meatballs, then garnished with just a bit more sauce at serving time, for good measure, these meatballs disappear faster than you’d ever imagine. Yes, this aforementioned family member has been known (more than once) to polish off 18 meatballs in one sitting – with never an unhappy gut to follow. Again, so very happy! By the way, all the other family members, special dietary requirements and free-grazers alike, enjoy this meatball recipe. So, don’t tell anyone, just serve ‘em up, sit back, and keep your fingers clear of the serving utensils. One more thing … Going to a Super Bowl party? 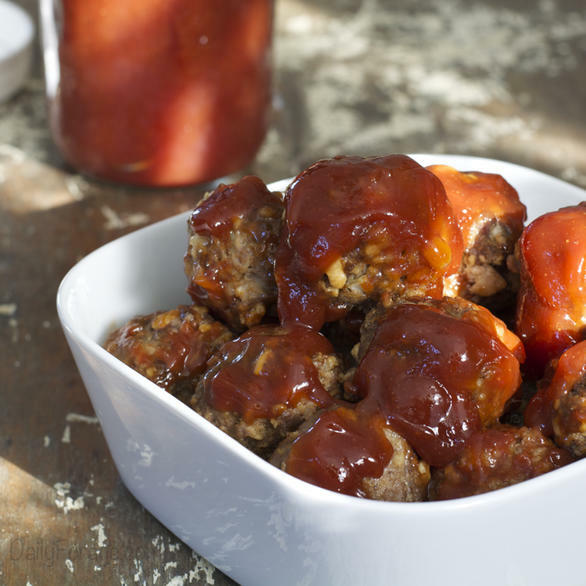 Make these into smaller, single bite-size meatballs, following original directions, then place cooked meatballs in a slow cooker with some extra sauce, and you’ve got the perfect party appetizer substitute for the traditional cocktail weenies. You’ll be making everybody so happy. Preheat oven to 350ºF. Prepare 2 large jelly roll pans, or baking sheets with edges, by lining with foil and spraying in a light coat of cooking spray. Cooling racks can also be placed in each foil-lined baking sheet. This will allow meatballs to cook more quickly and drain any excess liquid. Set aside. Place all sauce ingredients in a small sauce pan, stir to combine, and heat over the lowest stove setting. Stir occasionally to prevent scorching on the bottom. Heat until sauce has thickened a bit. Remove from heat and use according to recipe above. Place any remaining sauce (after the meal has been served) in a jar in the fridge. Will last up to three months. Place baking sheets in oven on separate racks. Bake about 15 minutes, then rotate baking sheets top to bottom and front to back. Bake an additional 20 minutes. 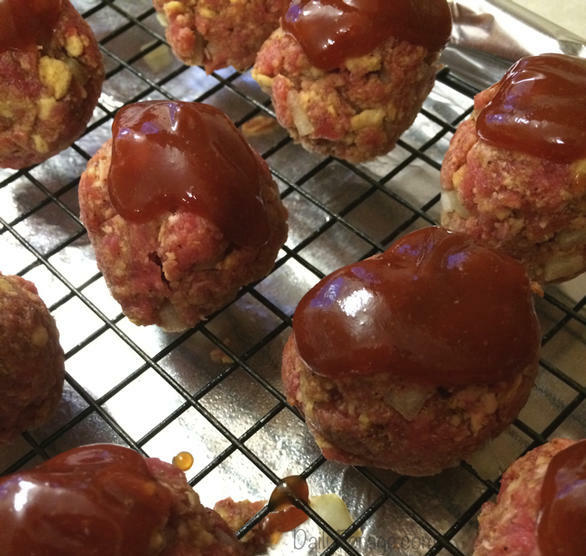 Once baked for 35 minutes, slice one meatball in half to be sure the meat is thoroughly cooked. Remove from oven and let rest about 5 minutes. Serving Suggestion: These meatballs complement a bed of white sushi rice perfectly. 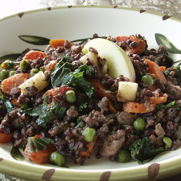 Serve with steamed green veggie, such as broccoli, and a green salad for a well-balanced meal. Notes: This meatball mixture can be mixed up to 24 hours in advance and stored in an airtight container in the refrigerator. Once you’ve formed the meatballs, allow them to rest at room temp for about 20 minutes before baking. This will ensure they cook evenly. 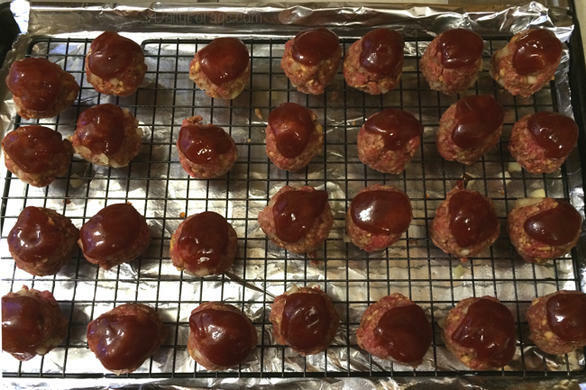 Meatballs can also be formed, then frozen on a baking sheet. Once completely frozen, remove from baking sheet and store in a re-sealable freezer bag. Thaw in refrigerator before baking. Cooked meatballs can also be frozen and reheated easily in the microwave.